Visions of Jesus Christ.com - Alonso Diaz Barrios - Stigmatist. 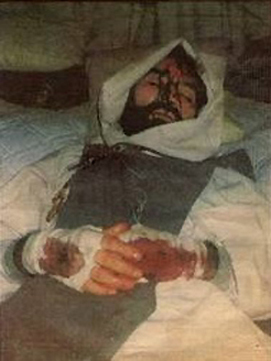 Images are newspaper clippings about Alonso Diaz Barrios with visible stigmata. Reported [here] and [here]. Rough translation from Spanish. Note: The following comment was taken from the weekly LLANO 7 DAYS of the day January 11 2000 -The Stigmata of Christ in Alonso Diaz Barrios. Lay motionless on the bed of his bed covered with a sheet that only allowed to see his face bathed in a red tendrils of the same color of blood, that ran him from forehead to his beard. A few wisps were dry, others fresh. It was wounds and blood dried. It's something special. His face did not budge. Even before the flashes of FHAs camera that shot to capture that moment. Anyone would think he was dead, but is mild rhythmic movement as could be seen from his breast breathing. That's the image that LLANO 7 days saw last Friday towards half past four p.m. in the room Alonso Díaz Barrios, a 52-year-old who lives with his wife Elizabeth and their two children Bogota 18 and 13 years at the Abbey Bridge sidewalk in Villavicencio. There with 21 families share, from a year ago, the project Ingenio Family Association Alliance, which guides Bishop Alfonso Cabezas Aristizabal, bishop of the Diocese of Villavicencio, Colombia. A day before Alonso told to LLANO 7 days living this experience from 15 years ago when the virgin Mary, with his wife, gave them a call to conversion. The first two years was the call of the Virgin Mary, after eight years were internal manifestations and five years are external. Alonso said that every Friday after three p.m. from the crown of his head will flow blood to the face and on his hands and feet where states have similar wounds to Jesus when he was crucified. Wool gloves cover you from above the wrist to the thumb and middle finger births. 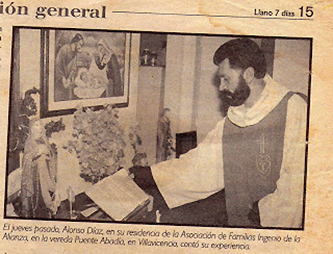 Fifteen years ago when his father Jorge Alberto Hernández he was named pastor of Santamaría Stone in the Diocese of Facativa (Cundinamarca), the Virgin Mary gave me the call to conversion. They were visions of the Virgin, which dictated me messages and I talked about it all had to live very much in love of the Lord. After the joyful and glorious virgin told me he was ready to take me into the arms of Jesus. In the chapel of Santamaría Jesus received me and his first words were that I wanted to share with me his passion. Jorge Alberto's father was my spiritual guide throughout this time, until now. He gave me the stigmata for eight years internally. I lived the agony and passion, but there was still no death or resurrection. At that time the Lord gave me the inner wound on the right side of the chest. I had three consecutive days of internal manifestation. There was a blood transfusion. There was vomiting blood and was taken to hospital and underwent tests, but clinically found nothing. It was fine. During all these experiences the Lord was stripped of everything, because he wanted to live more intimately with me. Days before the visible demonstrations that began March 4, 1995, my health was very delicate: I started swelling hands, feet, side, forehead. I went to the hospital for a month, but I found nothing. All this time I've been given to prayer with my family. This experience is presented every Friday because pain is Friday, when the Lord gave his life to save us. During this time of death is a beautiful experience because it is the very special encounter with the Lord. Where the face of Jesus and mine merge into one. I feel everything that he suffered and suffered. The same is always repeated. The face of the Lord in flogging is a lot of pain, but has a very sympathetic look like sadness, see the ingratitude of the people, our brothers. To see what came to give us the best, your life what you pay. His gaze is deep sadness, but of conversion, he is always watching us. The case of Alonso Diaz Barrios is not the first known case in the Department of Meta another was [Roque Jacinto Solaque].